Visit the small Mexican village of Las Palmas, where you'll embark on a lovely horseback ride along the San Sebastian River, and through the lush tropical jungle. 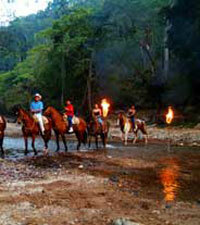 You'll explore shallow rivers, and witness breathtaking views from a scenic viewpoint. As the sun sets behind the mountains, you'll make your way back along a torch-lined path to the picturesque Rancho Capomo to enjoy a Mexican barbecue dinner, complete with beer, margaritas, soft drinks and a fun Mexican lasso and dance show performed by local villagers. 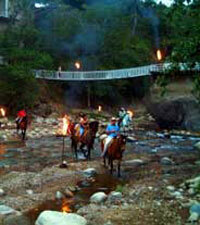 A fun way to spend an evening in Puerto Vallarta! Departs From: Collage Disco in Marina Vallarta and Hacienda Palma Real in Nuevo Vallarta. Restrictions: Weight Limit is 240 lbs (110kg).